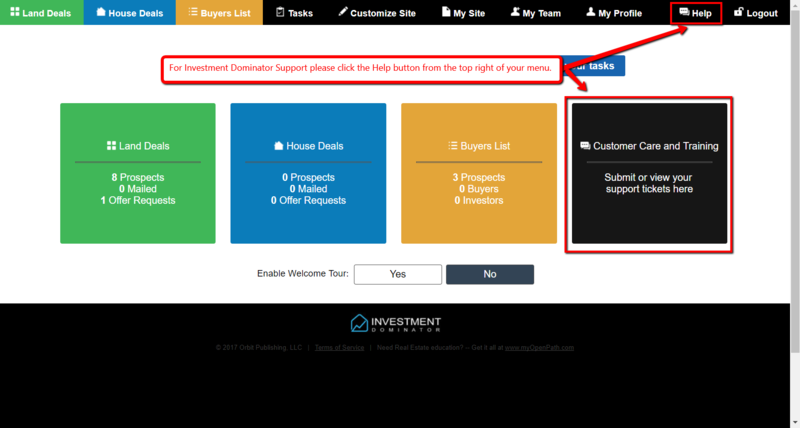 PLEASE NOTE: If you have an Investment Dominator account, please login to your admin console and contact support by clicking on the help button located at the top right corner of your CRM. If you do not have an account with us, or cannot login to your account for some reason, please use one of the support options listed below. NOTE: Our support will only answer questions about the techniques discussed in your training program. They cannot give out investment recommendations, or analyze specific deals that you are working on. Click here to view our extensive (easily searchable) online user guide.